I was thinking...there are days that just don't go the way you think they will. We've had so many of those lately. haywire for one reason or another. It could make you crazy but what's the point in that? Stop and appreciate the little things. That's my frame of mind today. I stay at home most of the time, so my plans are generally things I do here. Loving the polka dot creamer! I hope your tomorrow is better than your today! Hey Stacey, I'm telling you, this has been the busiest year with unexpected things coming up it seems every week... So yes, I have a long list of things not getting done as quickly as I'd like. I'm always making a new plan. But I agree with you, it's nothing to get all crazy about. Hope you have a good week! Stacey, it is so important to appreciate the little things...changes everything. You are very wise, but I knew that! Stacey, I couldn't agree more and what's the point of stressing out? Honestly, I don't know if I'll ever see everything scratched off on my to do list anyway... lol. Stacey, thanks for letting me know about being a No Reply Blogger. Who knew? Hopefully, I have corrected the problem. Yikes! First of all -thanks for popping by and leaving me a sweet comment today. It does happen, thankfully today was not one! One glitch, I could not sleep and I'm awake and it's 1:00 am! I was expecting my aunt and cousin to come for a visit on Sunday and spend the night. Instead, they arrived on Saturday and stayed 2 nights. When your aunt is 90 years old and has never visited your house, you welcome her with open arms - and go kayaking with her. But, my weekend was totally thrown off. Hope your week runs smoothly. Hi Stacey, I think we all have days like this once in a while. They do throw us off, but you are right, just go with it and make a new plan. Pretty pics you share. 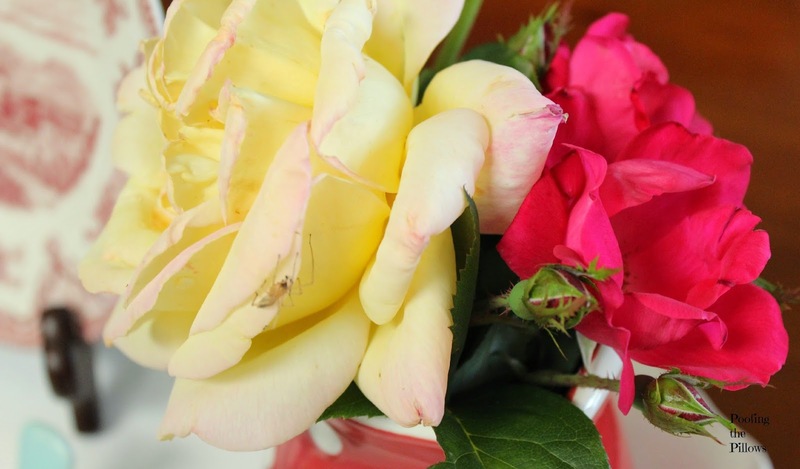 Even the little bug on the yellow rose is precious! I agree sometimes you just have to put the list aside and enjoy the day for what it is. Change in plans can be a good thing. Love the pics of the roses soooo pretty. I try and appreciate the little things every single day! Pretty shots, Stacey! Your vignette is so sweet (love the red polka dots)and what a great attitude you have when things go wrong. I think flexibility and positive attitudes make the world a better place! I think we all have days like that. I try to "roll with it" but it's hard sometimes, especially for such a strict list maker like me. :) Love those little birdies! Are they salt and pepper shakers? So cute! It goes with the territory...and it's a big territory. I've tried to learn to let it not control my feelings. I guess I'll always be working on that though! lol! Hang in there. I could hear Amen's all over the world!! My frame of mind right now is, to work up the energy needed to pick up my three oldest grandchildren from school and keep them for the evening. Your pretty vignette inspired me today, and your words made me smile. I've had a solid two weeks of that very thing, I agree, you just have to make a new plan and wait for things to calm down a little. Hope things are calming down a bit for you. Have a great weekend! The little things often turn out to be the very best things!!! I hope you are having a much better day today, and will have a wondrous weekend!! My work days never seem to go as planned. I try to make the best of it and go on. Try to keep a good attitude but I love it when 5:00 comes around and it's time to go home. Hi Stacey, stopping back by again to say hi. Hope you are enjoying our perfect weather mixed with a bit of rain now and then. More coming this week but the gardens are loving it. Agreed! :) No need to cause extra stress and tension for ourselves. 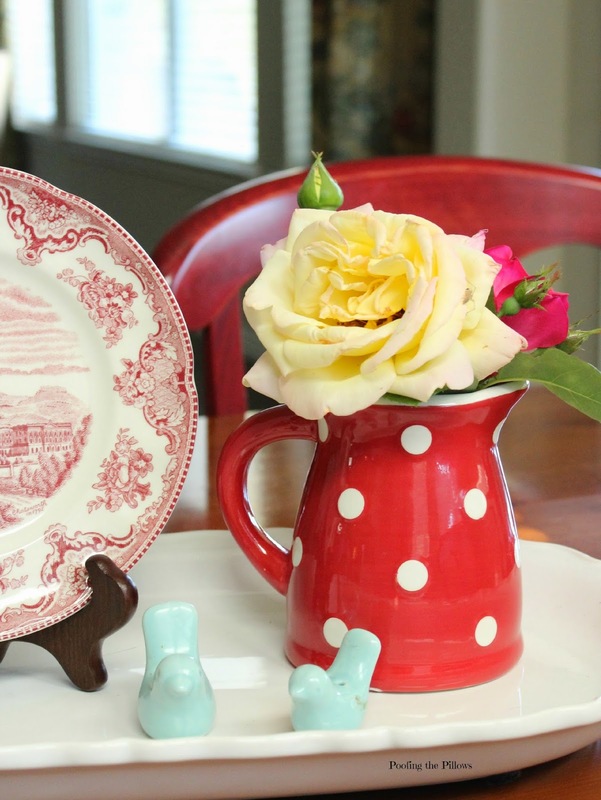 The flowers are so pretty and I'm loving that red & white polka dot pitcher. Lovely blog you have here, beautiful posts.